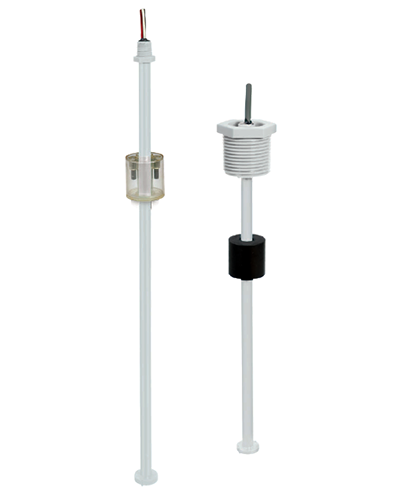 Gems® type XM-300 & XT-300 compact size float level sensors are designed for the high quantity needs of the OEM and are the ideal sensors for shallow tanks and reservoirs. Compact and versatile, these plastic level sensors offer a broad choice of mountings and float materials. Gems® type FS-930 oil flow switches compensate for viscosity change in fluids. Their unique, patented design assures accuracy witin 20% over a full range of viscosities – from 40 to 2000 SSU. They are ideal for use in applications where liquids of different viscosities are blended, or for use in lubrication systems where oil flow monitoring is critical at start-up. Each unit is factory preset using 300 SSU oil for actuation at specified flow rates and compensates for viscosity changes automatically. Gems® series PS71 are versatile general purpose switches with snap action microswitches that can be used in a wide range of hydraulic and pneumatic applications. Their proven piston/diaphragm design offers outstanding accuracy over a very wide pressure range. Users can easily configure this model to meet their needs. Gems® series 830 standard differential pressure transducers are designed for wet-to-wet differential pressure measurements of liquid or gases. These units feature bleed ports that allow for total elimination of air in the line and pressure cavities. They are commonly used for liquid level measurement, filter monitoring, liquid & gas flow measurement, process control systems, and energy management systems. Gems® type FS-926 low flow switches provide reliable and consistent performance with repeatability within 1%. They are factory preset for actuation at specified flow rates. They provide accurate detection of excessive or insufficient flow rates in such applications as: protecting against loss of fluid flow in hydraulic systems, assuring proper coolant flow in semiconductor processing equipment, monitoring high pressure lubrication systems, and ensuring proper air flow in water/waste systems.